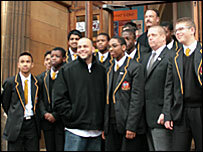 As violence affecting London's teenagers grabs the headlines, a former New York gangster has been urging school pupils to avoid crime. For two days 29-year-old Sergio Argueta has been spreading a message of non-violence inspired by civil rights leader Martin Luther King and Mahatma Gandhi. The El Salvadoran spoke to teenagers about forgiveness and reconciliation as part of Breaking the Cycle, a US-based programme designed to encourage youngsters away from gang culture. During 2007, 26 teenagers died in London as a result of knife and gun crime - another three have already died since the start of the year. While the Metropolitan Police is keen to play down links between the recent murders and an alleged rise in gangs, Breaking the Cycle highlighted the appeal of gangs for young people. 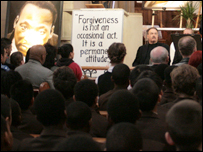 At an assembly in a church, Mr Argueta warned pupils from St Bonaventure's Roman Catholic School in Forest Gate that gang culture was not the glamorous lifestyle portrayed in popular culture. "There's nothing beautiful about the 'hood or the poverty," he said. "There's nothing beautiful about being in a correctional facility and being fed through a cage." 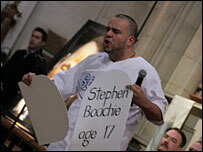 Mr Argueta told the teenagers he had attended the 19th funeral of a friend, a 23-year-old man, three weeks earlier. "In the US we lose more young kids to gun violence than in any other industrialised country," he said. He joined a gang as a teenager and planned a drive-by shooting in retaliation for the death of one of his friends, which then led to another friend being imprisoned for killing a rival. "I chose a lifestyle that I would not chose for my worst enemy," he admitted. "I didn't believe in the value of life because I didn't love myself. It wasn't because I didn't have love in my house. It was because I had to adapt to the streets. "I'm not here to point fingers, I'm just here to wake you up." Despite having been expelled from one high school and "barely graduating" from another, he went on to get a master's degree in social work and founded an organisation, Strong, to help youngsters avoid gang life. Another of the speakers was Christoph Arnold, an author from New York and a member of Church Communities International, a community movement dedicated to non-violence which runs the Breaking the Cycle tour. He told the students about his experiences at civil rights rallies led by Martin Luther King. "Forgiveness in the end is the only answer to this culture of violence that we live in," he said. Police from New York State and Newham were also at the event. Sheriff Paul Van Blarcum from Ulster County in New York State said youth crime and gang culture were not being tackled early enough in the US and this had led to no-go areas in his county. "The message I'm trying to get across is that you have problems in the UK now and you have to get on top of them before it is too late. "The police have to hustle to hold their own." In London, 1,392 people aged under 19 were reported as victims of crime during 2007, a slight drop since 2006 but still considerably higher than in 2003, when there were 1,022 reported victims. Across the city, 13% of gun crime victims and 25% of offenders in 2007 were under 18 years old. Whether or not gang culture is the cause of street violence, the discussion is relevant to London's teenagers, according to Stephen Foster, head teacher at St Bonaventure's. "Our students have frequently been the victims of crime," he said. "This reinforced the message we give them - don't retaliate and don't carry a weapon." One pupil, Viscant Igbinoya, 14, said: "In my area there is a lot of trouble - flats get burned out and people get robbed. "I thought that being a gangster would get you credit but I learnt that it's not like that. "When Sergio said so many of his friends were in prison or dead, that was really shocking." What can be done about gun crime? How do you get teen gangs off the streets?